Electrical power system operates at various voltage levels from 415 V to 400 kV or even more. Electrical apparatus used may be enclosed (e.g. motors) or placed in open (e.g. transmission lines). All such equipment undergo abnormalities in their life time due to various reasons. For example, a worn out bearing may cause overloading of a motor. A tree falling or touching an overhead line may cause a fault. A lightning strike (classiﬁed as an act of God!) can cause insulation failure. Pollution may result in degradation in performance of insulators which may lead to breakdown. Under frequency or over frequency of a generator may result in mechanical damage to it’s turbine requiring tripping of an alternator. Even othervise, low frequency operation will reduce the life of a turbine and hence it should be avoided. It is necessary to avoid these abnormal operating regions for safety of the equipment. Even more important is safety of the human personnel which may be endangered due to exposure to live parts under fault or abnormal operating conditions. Small current of the order of 50 mA is sufﬂcient to be fatal! Whenever human security is sacrificed or there exists possibility of equipment damage, it is necessary to isolate and de-energize the equipment. Designing electrical equipment from safety perspective is also a crucial design issue which will not be addressed here. To conclude, every electrical equipment has to be monitored to protect it and provide human safety under abnormal operating conditions. This job is assigned to electrical protection systems. It encompasses apparatus protection and system protection. 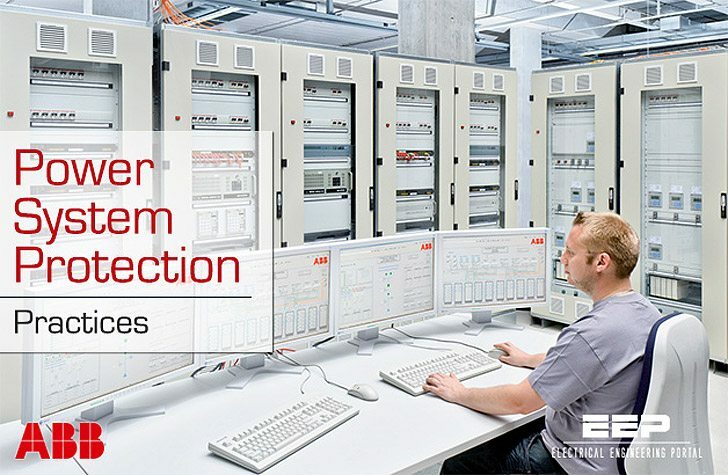 Here, on this page you will find 10+ ABB’s power system protection practices that can be of great help to protection engineers and others. Guides are free to download. 2 Relay Coordination and Selective Protection . 3 MV Feeder Short-circuit Protection . 4 MV Feeder Earth-fault Protection . 5 Protection of HV Transformers . 6 Protection of Meshed Networks . 7 Protection of Shunt Capacitors Banks . 9 Protection of Synchronous Generators . 12 Impedance-based Fault Location . — Complete guide to the good protection of medium voltage networks . — Elements of power distribution systems . — Working with trip characteristic curves of low voltage circuit breakers . — The basics of MV switching equipment for protecting electrical installations . This is a very standard and concise way. Thanks for the job. It’s very important information for an engineer for details and depth in electrical engineering and mastering the note calculated for each part of the electrical installation Low Voltage and Medium Voltage. this website is very helpful to electrical engineers. good work! this website very useful to know about practically what happening in electrical terms especially in power systems….would you help to download totally power system in single book.because i search lot of websites for some practical terms about power systems. and KVAr is the reactive power. In case of inductive circuit the current lags behind the voltage and in case of capacitive circuit current leads the voltage..
this site is so good and I am really addicted to this.